Claudia had never made hake before and now this recipe, which Mark says is the most useful one in the book, is in her repertoire. Combine the olive oil, half the parsley, and the garlic in a cazuela or sautŽ pan large enough to hold the fish and clams in a single layer. Sprinkle the hake on both sides with salt and add to the cazuela skin side down. Dust the fish with flour, then add the clams and 1/2 cup water and bring to a simmer. Cook for 2 minutes, then turn the fish, lower the heat and simmer very gently until the clams open and fish is cooked through, about 5 minutes. 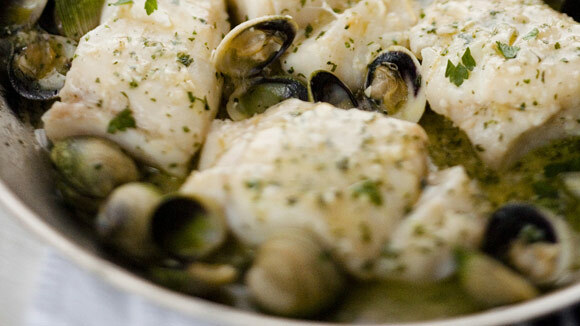 Divide the fish and clams among four plates, stir the pan juices, and spoon over the fish and into the clams. Sprinkle with the remaining parsley and serve.